A rock-solid solution . . . for structural concrete crack repairs!!! 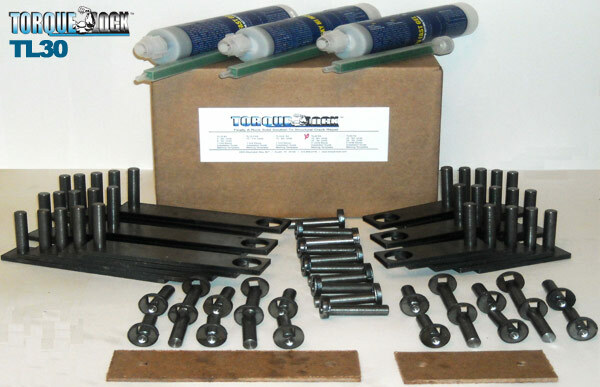 Scroll down to browse through information about the Torque-Lock System, for making structural concrete crack repairs. Make a rock-solid repair, with the Torque-Lock staples and stabilize the crack, by preventing expansion. The Website Store Directory contains an alphabetized listing of all products for sale. We don't just sell products. We help you make a better-informed choice, by providing all the information, you might require. Need ordering help? Scroll down the page, for the Order Desk Telephone Help Number. All items ordered will end up in the same shopping cart, no matter which page of this website, the items are located. All Major Credit Cards and PayPal are accepted. Order one today. You've been around the block once or twice to know that it's impossible to "glue" any type of structural crack together using epoxy pressure injection systems. Repairing cracks is not rocket science and the product you choose either fixes the crack or it doesn't. 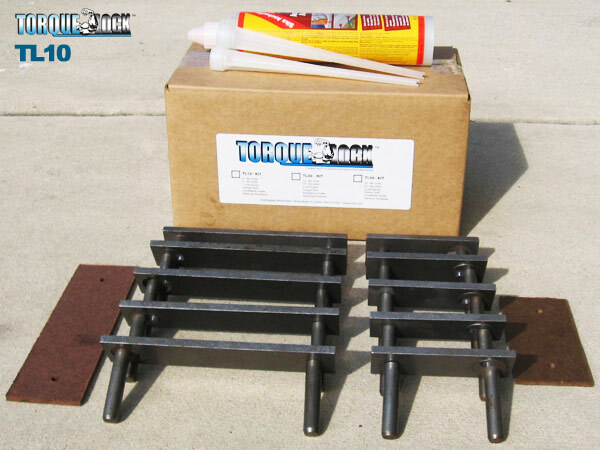 Enter Torque Lock™, the new revolution to structural crack repair. 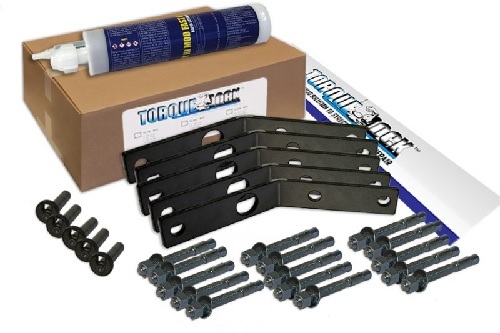 Using Torque Lock™ Staples along with a quality epoxy (supplied with the kits) can help you repair your concrete cracks, easily repair basement cracks, fracture lines in your foundations, driveways, walls, seawalls or any other structural crack. For example, water leaking through a basement can place a serious financial burden on the owner of the home to replace the damage, since large volumes of water can be detrimental to the structural integrity. Another example, water leakage through the floor or wall of a swimming pool can soften the soil in which the pool is embedded and cause weakness in the support of the pool. They can also weaken the structural integrity of the pool structure itself. Similar problems result from these in other types of cement structures, such as dams, bridges, and seawalls. A variety of different conventional approaches have been attempted, but with little success. For example, epoxy injection although these types of sealants are largely insoluble in water, they cannot be forced deep into cracks. And, such conventional materials do not adequately bond to the adjacent surfaces of fractures in the concrete. At the most, epoxy sealants will only form a surface patch over the problem. Water will eventually seep in and around the temporary patch and escape through the cracks in the concrete. In order to provide a rock solid repair, you must stabilize the crack, and as we previously stated, epoxy alone is not strong enough to stabilize a crack from widening. When Torque Lock™ Staples are combined with epoxy, you can rest assure that the structure has been stabilized and fixed, permanently. 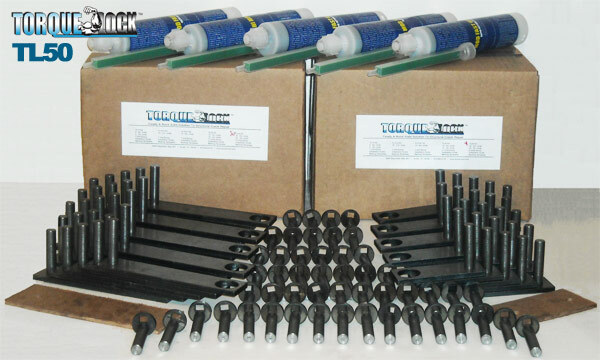 The Torque Lock™ Staple is a revolutionary "concrete stitching" technique that is great for repairing structural cracks on any solid cement based surface. Using its patented Cam Lock™ technique, it stabilizes the crack by creating up to 5000 lbs of compression torque for each staple installed and keeps those 1/4" fractures from becoming a 1/2" fractures. Repairing Corner Cracks - NEW!!! 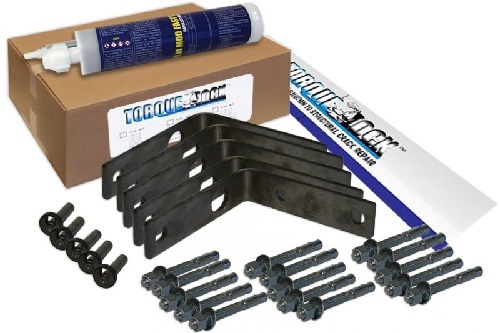 Now you can use the same type of Torque-Lock Technology to repair structural, concrete cracks, that occur in corners, as opposed to pool floor or wall locations. Used in a similar manner, the staples are set an either a 45° radius (angle) or a 90° radius (right angle). Depending on the angles of the walls, coming together in a corner, one or the other of these two kits should help you repair the problem. The two kits can repair corner cracks, up to 5 feet or 1,55 meters in length and include everything required to make a rock-solid repair. They are used in a manner similar, to that of the standard Torque-Lock staples. Using the template provided, trace and mark cutouts along crack approximately every 12 inches, where the Torque-Lock Staple will be installed, Alternate between large and small templates. Use a pencil to mark the circles, to indicate the location for the holes to be drilled on both sides of the crack. Drill into structure a minimum of 4-inches deep using a 1/2-inch. masonry bit, where the holes were position in step 1. Use a masonry saw, to cut into the surface along the previously marked lines. Make the cuts approximately 2-inches deep and chip out the inside of the rectangular shaped area, in order to provide a recessed space for the staples. Drilling deeper, than the recommended depth of 4-inches, will not affect the performance of the Torque Lock Staples. Do not chip out an area more than 2-inches deep. Assemble the Torque-Lock Staples, before hand. Using the epoxy provided, apply some into the previously drilled holes. Using both hands, push the pins into the holes, drilled in the previous step. Push the Torque Lock Staple, back towards the concrete surface, until the plate is recessed approximately 1.5–2 inches into the wall. Tap with a hammer, if required ands make sure the staple is uniformly positioned. Avoid getting epoxy on the Cam or Locking Plate. Important. Make sure that the ratchet square is facing inward, as shown, when positioning the Torque-Lock Staples. Make sure that the epoxy has set up. Read the label for the manufacturer product instructions. Use a torque wrench and a 3/8th’s ratchet attachment and insert into the ratchet square. Tighten clockwise, not exceeding 180°, until 40 pounds of torque is reached. Do not tighten more than 40-pounds of torque pressure and do not turn the torque wrench more than 180°. Use a carbide or diamond masonry blade, to open the crack, between the installed staples, into a slight "V" shape. Clean out crack and cut outs, removing all dust and debris. Using a non-shrinking, hydraulic cement) fill in crack and cut outs. Trowel to tightly pack in cement, taking care not to leave and voids and leaving the repaired area smooth and ready for refinishing. You can cover over the repaired area(s) with any finishing product, that best matches the surrounding area: plaster, aggregate finishes, paint, tile, marcite, cool deck, etc. ● Available in three sizes, for crack of up to 10, 30 or 50 feet in length. Can be combined to accommodate all crack repair situations. TL50 - repairs 50 feet or 15.5 meters. Torque Lock™ is proud to announce that it is among the Top 50 most promising products of 2005 - Pool and Spa News. 5 feet or 1.55 meters TLR-45 includes 5 staples to repair a 5 foot corner crack, with a 45°angle. 5 feet or 1.55 meters TLR-90 includes 5 staples to repair a 5 foot corner crack, with a 90°angle. Make concrete crack repairs . . . rock solid. Scroll to view product options and to place an order. Includes: 5 of the 6" units, 5 of the 3" units, 1 unit of epoxy, Installation guide and Marking Template. Includes: 15 of the 6" units, 15 of the 3" units, 3 units of epoxy, Installation guide and Marking Template. PayPal membership is not required. Includes: 25 of the 6" units, 25 of the 3" units, 5 units of epoxy, Installation guide and Marking Template. Two Cartons - Total Weight: 86 lbs. These two kits are designed for use in repairing corner cracks only. All sales of this product are final. No returns accepted. Please review shipping terms and returns policy below. Place order above. Shipping charges will be calculated and added to the order, based on quantity and destination. Some Orders, based on quantity and destination, Outside Of The Continental U.S. May Require Additional Shipping Charges, because of the weight of the product. Shipments are made via Priority Mail International or UPS, with an expected delivery of 7-10 days, after shipment. You reserve the right to cancel and receive a full refund, should you decline to proceed with the shipment. All prices and product specifications are subject to change without notice. Aqualab Systems, Inc. or the Askalanaquestion.com website shall not be held responsible for pricing, graphic or typographical errors. Errors can happen and we assure you that it is our attention to minimize these instances. If you have reached this particular page via a search engine link, please ensure you are not viewing a cached page or a page that has been attached to another website, as it may not be current. Prices charges do not include any applicable duty or taxes and are the responsibility of the buyer. Any claims of incorrect items, shortages, shipping damage or failure to perform properly. must be reported within 7 days, of the receipt of the merchandise. All sales of this product are final.